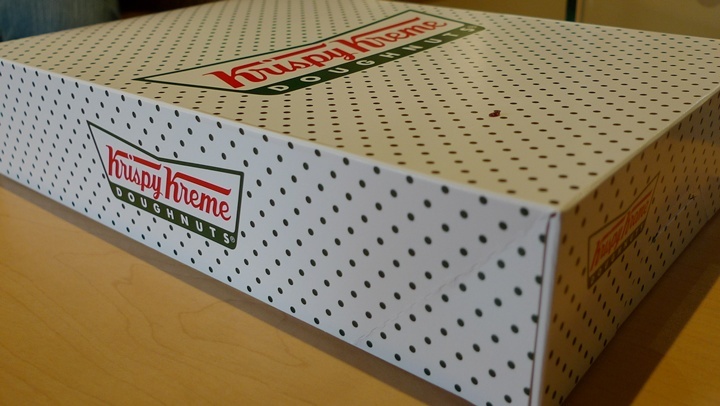 Krispy Kreme has to be THE most popular doughnut chain all over the world. Originating from the States, since 1937 (yup, read that right, an amazing 62 years of legacy, and still expanding like no other), the company has an impressive track record, serving warm, fresh from the oven doughnuts to millions of customers spanning the decades, from the States to Australia, as well as doughnut fans in Asia. Initially, there was the surreal hype surrounding the opening of the store at Berjaya Times Square in KL, with free doughnuts all year round on offer, people camped and queued like mad (two nights before the opening, can you imagine that?!) for a chance at the exclusive vouchers, bound to elevate any soul to a sugar rush, and subsequent booming business to us healthcare professionals. I stayed away from any unnecessary queues, and only relented after more than a month since its opening. On a weekday’s evening, the line at the counter was almost non-existent (unlike JCo Donuts @ Pavilion, whereby even after few months, the crowd was maddening during peak hours). I picked my doughnuts at a leisure pace, scrutinizing each and every variety, before picking 6 of them. 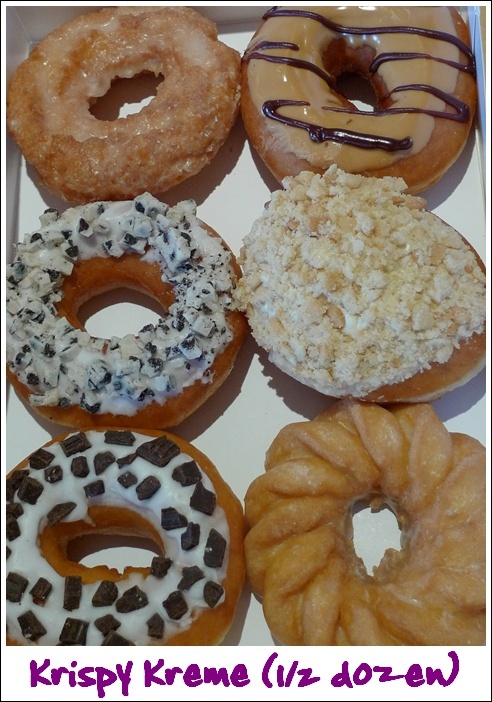 Note that at Krispy Kreme, they do not provide any half dozen offer for the doughnuts, unlike its competitors in Malaysia, namely Dunkin, JCo and Big Apple. Hershey’s Cookies & Crea (the middle one). Priced at about RM2.50-RM2.80 per piece, the price is indeed steeper compared to JCo or Big Apple, as they do not offer half dozen special rate. But there is discount for one dozen purchases. The Peanut Butter flavoured doughnut (the far most) was the only one that was not sickeningly sweet! Thankfully. Verdict? VERY sweet. Yup, cloyingly, sickeningly sweet doughnuts. They’re meant to be dipped into a hot cup of coffee (preferably black), hence the excessive sweetness. The moment I was on my third piece, I was feeling slightly nauseated from the sugar rush. The experience reminded me of bingeing on Indian sweetmeats (those famous colourful desserts at Indian restaurants). The size of the doughnut is slightly larger than JCo’s or Big Apple’s, the dough a little dense, somewhat a cross between Dunkin’s harder texture and JCo’s melt-in-mouth softer variety. Probably my expectation was way up in the clouds, from the overblown publicity and ravings, but the sweetness exceeded my threshold for sweet snacks. Location : Berjaya Krispy Kreme Doughnuts Sdn Bhd @ Lot 09-26, Level 9, Berjaya Times Square, No 1, Jalan Imbi, 55100 Kuala Lumpur, Malaysia. Tel No : 603-2119 7373. You should try Krispy Kreme somewhere else, not Malaysia. The best! ???????? I know Krispy Kreme is popular but didn't know it started business in 1937, that's SO long time ago! Geng! Aw, your post made me crave for donuts now! Gonna look for the nearest Krispy Kreme outlet around my area. Hehe! krispy kreme is a little pricey and looks sugary. but who cares?! it aims to attract ppl especially gals!!! i've not tried yet.hope to do so in my next trip to kl. u went there? ?din mention b4 to us also..
yup..its NOT for me either. siao! want us Msian to get diabetes or something! mboy: but in US, and almost all over the world, their doughnuts are supposedly … da bomb! Sugar Bean : and rmbr to dunk them in BLACK coffee 1st. fcoe : i thought i told you? it was during my last trip, went there for fun, as the place was empty, no queue. wmw : true, i'll take that into consideration. but the coffee there damn exp lah! more than the doughnuts themselves. thenomadGourmand : already high prevalence of diabetes in Msia, they shouldve cut down on the sugar, or offer a LOW sugar alternative. I think I agree with you, they should have come out with low sugar sort of. oklar give u the benefit of the doubt. looks very sweet…anyways must give it a try. 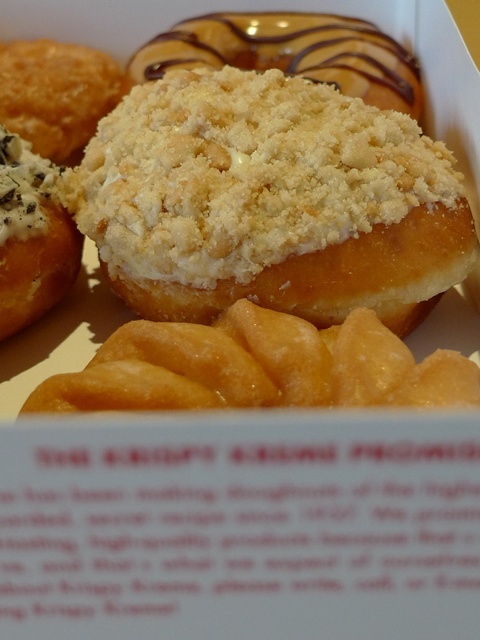 Is there a Krispy Kreme Doughnuts in Ipoh? cariso : yeah, least wont give us an unwanted sugar rush. fcoe : why doubtful? 🙂 give it a try the next visit to KL ok? PerutBesi : how true. already high prevalence of diabetes in Msia. Missha : looks good eh? there's none. yet. 😉 only Big Apple. lol Big Apple?? i heard it is in Jusco right? Mid Valley Megamall's outlet is opened but not many people there. I didn't buy any, everyone says that Malaysia's is not as good as in other country. 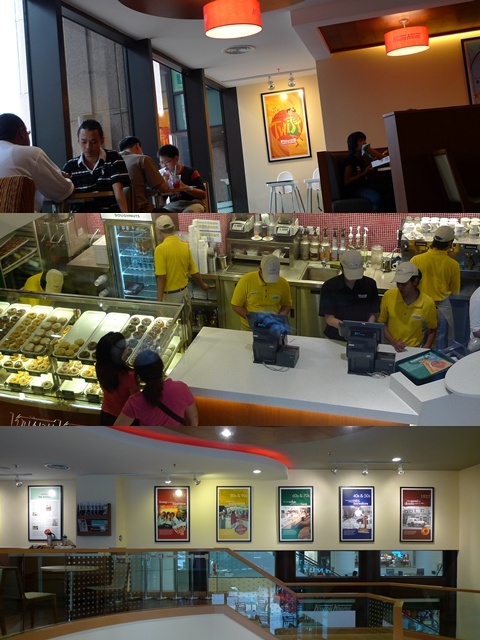 I don't really know how will Dunkin Donut survive in mid valley with Big Apple and Krispy Kreme so near lol. Both are just a few shops apart. I find them too sweet for my palate! Not really a donut fan… but if i must eat one, i prefer Big Apple, haha! Missha : Dunkin's not so hawt now, compared to the new generations of JCo and Big Apple. Simon : yeah, nowadays I only go for Dunkin when stopping over at Tapah rest area on the highway. 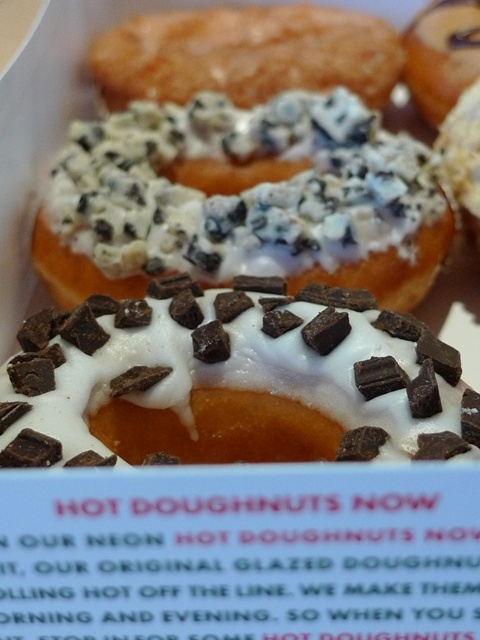 Pureglutton : i like JCo's glazed, but Big Apple's other varieties are cool as well. maybe cz used to Big Apple's taste over here in Ipoh. Now another choice beside Jacy and Big Apple for donuts! The donuts look different from Big Apple's donuts. Make me drooling. babekl : you think so too? yeah, they're indeed slightly over the top. Superman : it's slightly larger, and the Hershey's selections are rather good. Although I have sweet tooth, I somehow do not like donuts! Which is a good thing, otherwise I will be buying Krispy Kreme all the time! it is so a big hype and all and it is not nice? Missha : it's supposedly an order, or rather, a recommendation. for them to home quarantine themselves. but din notice the absolute ruling though. donuts are so much more comforting, and snack-y. xin : some may like them, but me not liking the extreme sweetness. .-= kellaw´s last blog ..Want to eat one of the best asam laksas in KL? =-. though the texture of the dough is not as soft as JCo’s or BA’s.